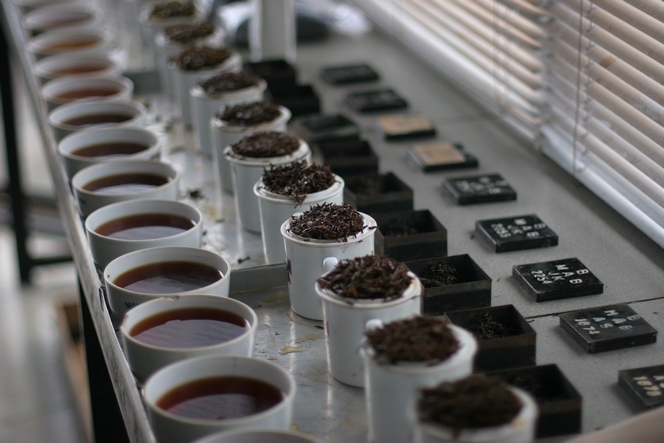 When we attend professional tea tastings, there is a great number of teas to assess. It can range from three or four to several dozen. Sometimes the teas we taste are all quite similar, like here in Colombo (Sri Lanka). They come from the same area, and you go from one to another, comparing them in turn. First you smell the various infused leaves, then you examine each liquor. In the trade jargon, we call the infused leaf an “infusion”, and the contents of the cup, the “liquor”. (To know more about it: see the article To choose tea, you need to have a good nose). The dry tea leaf is also presented so that you can look at it, feel and touch it, and get a complete picture of the particular batch you are tasting. Looking at the liquor is one of the first steps in tea tasting. While the temperature of the cup slowly falls, we pay attention to the colour of the liquid….